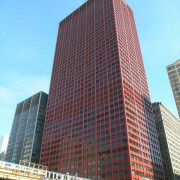 The CNA Center was designed by the firm of Graham, Anderson, Probst & White, and completed in 1971. 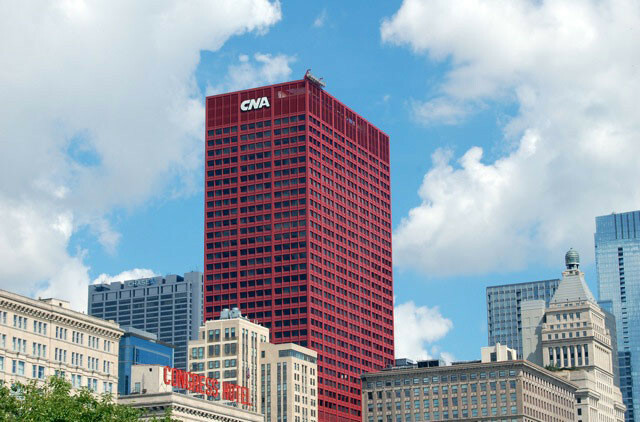 The CNA Center’s custom finish, “CNA Red” has transformed the 44-story building into an iconic feature of Chicago’s skyline. 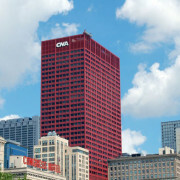 Located at 333 South Wabash Avenue, the CNA Center received its distinctive red finish, which was chosen to mirror the hue of the setting sun, in 2009. 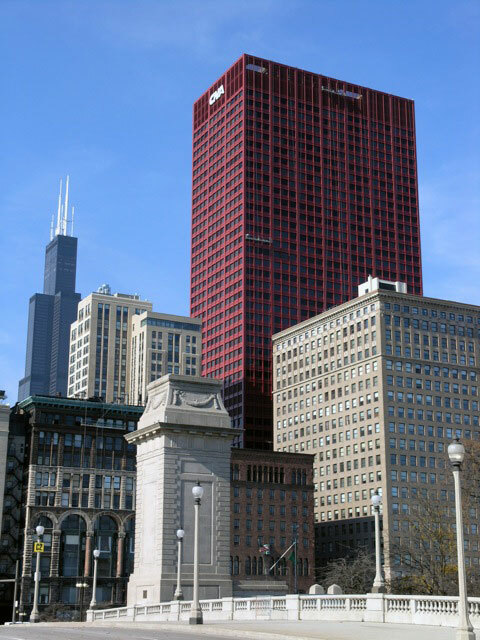 Chicago’s severe winters and lake front location increased the importance of selecting a coating system that provided exceptional weatherability. 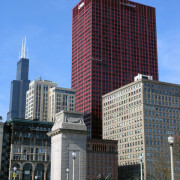 In an effort to select the ideal coating system, samples were applied to the building and exposed to a year of Chicago’s notorious freeze/thaw cycles. A Tnemec coating, Series 1072 Fluoronar® featuring LUMIFLON® FEVE technology performed best, satisfying all the environmental and aesthetic demands. The fluoropolymer coating system from Tnemec contains LUMIFLON, a solvent-soluble fluoropolymer with a unique chemical structure that ensures superior durability and extended weatherability. The project was completed in two phases. The first phase focused on repainting the steel substrate on the top 42 stories of the building, aluminum and galvanized louvers situated halfway up the building, and on the 41st and 42nd stories. Steel surfaces were prepared by hand and power tool cleaning, while existing paint on the aluminum substrate was removed using an environmentally friendly paint stripper. Substrates were over coated with Series 135 Chembuild®, a modified epoxy, followed by an intermediate coat of Series 73 aliphatic polyurethane, then finished with Tnemec Series 1072 Fluoronar in “CNA Red” containing LUMIFLON. 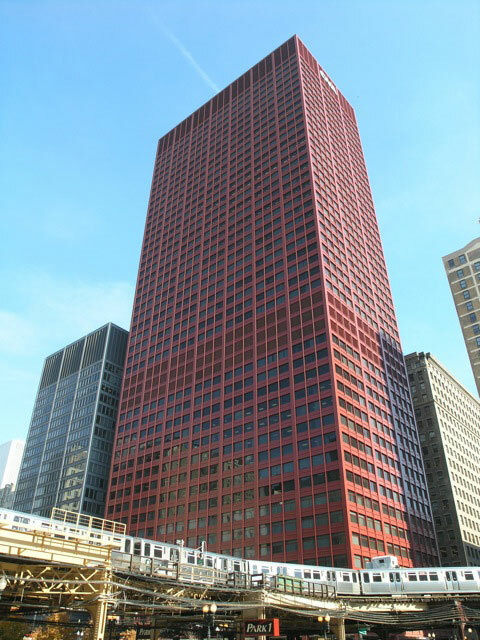 Next, the building’s lower two levels were coated. Existing finishes were removed, exposing bare steel. Recoating occurred in three stages. A prime coat was applied (Series 90-97 Tneme-Zinc®,) then an intermediate coat of Chembuild, and finally a finish coat of Series 1072 Fluoronar in “CNA Red”. LUMIFLON, a product of the Asahi Glass Company, is a solvent-soluble fluoropolymer that offers distinctive advantages to the architectural market. LUMIFLON provides architects with the option of using brighter colors and higher gloss finishes, with gloss values as high as 90. LUMIFLON offers the flexibility to be heat cured or cured at ambient temperature, allowing it to be used in new construction for shop applied coatings or for repainting existing structures in the field. LUMIFLON coatings can be used successfully on a number of materials, including steel, aluminum, fiberglass, concrete and polycarbonate for 30 years and more without fading.